At Atascadero Pet Hospital we welcome employment applications for the wide range of jobs and career openings available. Please email any certificates, licenses, and/or professional registration required to meet the minimum qualifications to office@apetcenter.com after completion of this application. All documents must be received prior to certification to the human resources department. Be sure to double check that your application is complete and signed, or it will not be accepted. 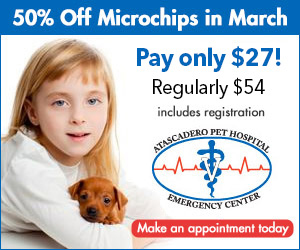 ATASCADERO PET HOSPITAL AND EMERGENCY CENTER (APHEC) IS AN EQUAL OPPORTUNITY EMPLOYER. WOMEN, MINORITIES, AND THE DISABLED ARE ENCOURAGED TO APPLY. IF YOU NEED ACCOMMODATION IN THE EXAMINATION/INTERVIEW PROCESS, PLEASE CONTACT THE HUMAN RESOURCES DEPARTMENT PRIOR TO THE SCHEDULED INTERVIEW.